Arguably, buying gig tickets on the basis of a couple of bonkers music videos is a bad idea. Then again, Kyary Pamyu Pamyu's music videos are amazing. Viral smash Pon Pon Pon is her most notorious work, but others, particularly Waste Land and Candy Candy, are a fantastic showcase of her 'throw everything including the kitchen sink into the video' style. If you clicked any of those links having not seen her before, you've probably either closed the window in confusion or dug her super-surreal hi-octane imagery. Also, if you watched Pon Pon Pon, then congratulations! You now have that playing on a loop in your head for a week. So it's pretty safe to say she's an acquired taste. 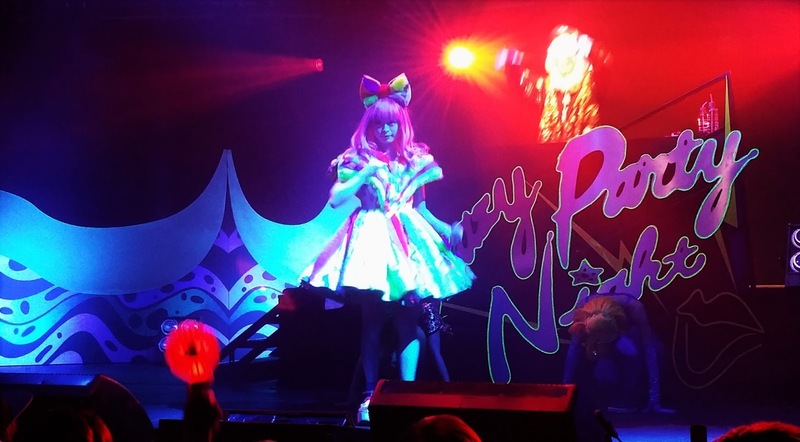 Even as someone who enjoys Kyary in small doses, I was a bit apprehensive about a full concert of her music. Not helping matters is that her team were at pains to let the British press know that "Kyary is not supposed to be musically talented. She is more about image." So it was to some surprise that Crazy Party Time 2015 not only supplied the expected Harajuku fashion-weirdness, but was genuinely musically enjoyable. Admittedly, I was pretty drunk, but extremely loud pounding techno and giant dubstep drops played accompanied by bright flashing lights does it for me. Kyary herself chirps away in some bizarre hybrid of English and Japanese, singing complex, almost Dylanesque lyrics like: "Chewing chewing chewing chewing chewing cutie cutie chew chewing love" or "Pon pon wei wei wei / pon pon wei pon wei pon pon." Some of her songs appear to be entirely chorus, mantra-like repetitions of five words over and over again until they're tattooed onto your brain. 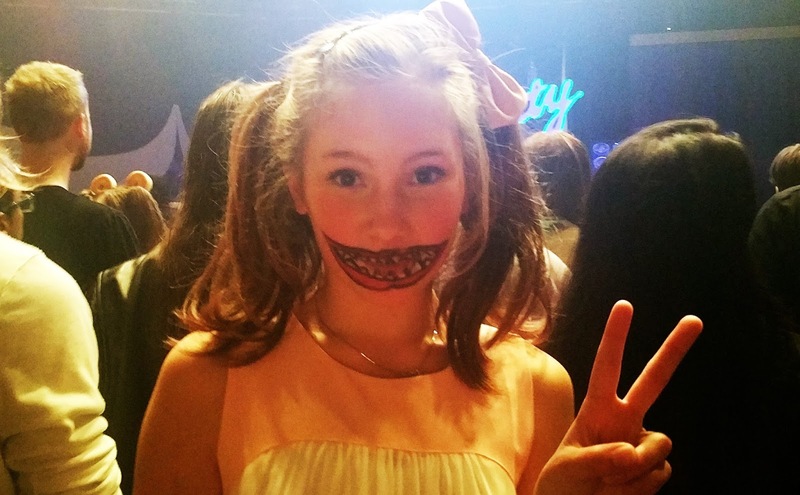 A typical Kyary Pamyu Pamyu gig-goer. 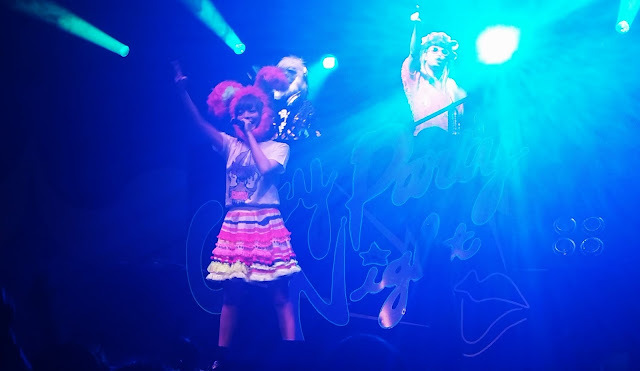 Compared to a Western pop concert, it's disconcerting how little room Kyary is allowed to express herself. It's like watching a hyper-realistic clockwork girl; someone's wound a key in her back and pushed her out onto the stage. It's a weird sight - a rictus grin plastered over her face as she works through complex semaphoric dance moves and poses so precise she appears to be communicating in sign language. This total absence of spontaneity makes for a odd atmosphere, contributing to the surreal nature of the music and imagery. There's something faintly inhuman about the way she marches with her legs completely straight around the stage, and the little girl kawaii poses she constantly strikes. She's the multi-coloured centrepiece of the night, yet ably assisted by some fantastic dancers clad in primary coloured wigs, similarly eye-catching dresses and masks that range from grotesque to sweet - looking a bit like a catwalk Sentai team. All that is accompanied by a video display flashing up imagery from her videos. Googly-eyed skulls rush at us, followed by processions of candle-headed ghouls and kaleidoscope visions candy, cakes and cherries. This onslaught of sweetness is a sight to behold; gazing back over the crowd most people are slack-jawed and beaming, bright lights dancing in their glazed eyes. Lots have come dressed for the occasion, the crowd a sea of pastel-coloured pigtailed wigs, sailor suits and slightly scary face paint - stuff you just don't tend to see at your average floppy-fringed Camden indie gig. Kyary Pamyu Pamyu's Crazy Party Time 2015 wasn't the most musically accomplished concert I've ever attended. It wasn't the most catchy. It wasn't even the craziest. What it was was a hell of a lot of a fun. 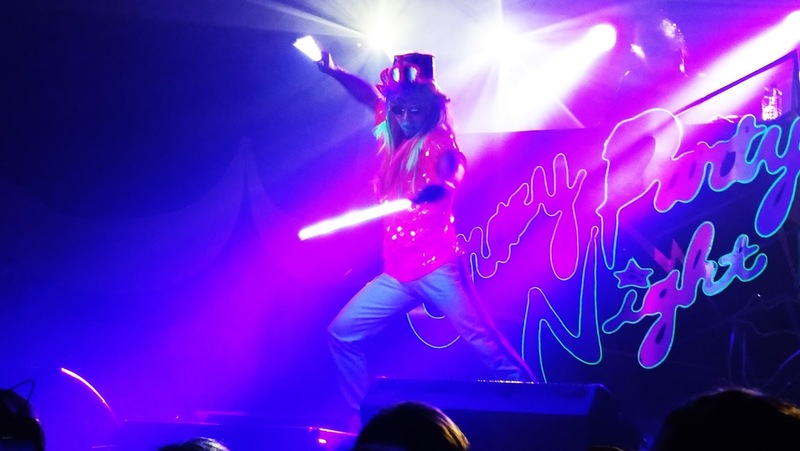 There was this infectiously good-natured vibe to the whole thing, a crowd buoyed up on Kyary's sugar rush music. The 90 minute set flew by; leaving me exhausted, sweaty and smiling uncontrollably. Damn good times. Damn good.